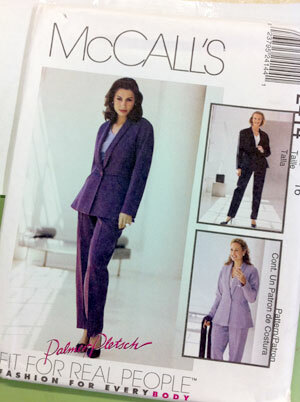 Oh, Outdated Sewing Pattern, what are you doing in my life? You mock me with your huge shoulders, your skinny legs, and your jacket bottom that makes even the models’ butts look disproportionately large. Did you seduce me with promises of a perfect fit? No matter. You will never be used to create clothing. Neither will you be put out with the recycling, or sent to the landfill to join the millions of tons of newspapers we send there each year. Okay, I know I said yesterday that I was making my paper cloth plain, but I looked at it as it was drying – yes, I was watching glue dry, which is just as exciting as watching paint dry, but offers time for reflection, nonetheless – and my paper cloth seemed so… plain. So white. So unadventurous. That is when I thought of my stash of unloved sewing patterns. I took out the one above, simply because I think it had the least possibility of ever being used, and I tore it up into large pieces to apply to my paper cloth. I took out the glue squirt bottle again, and I doused my unsuspecting paper cloth with my glue dilution. 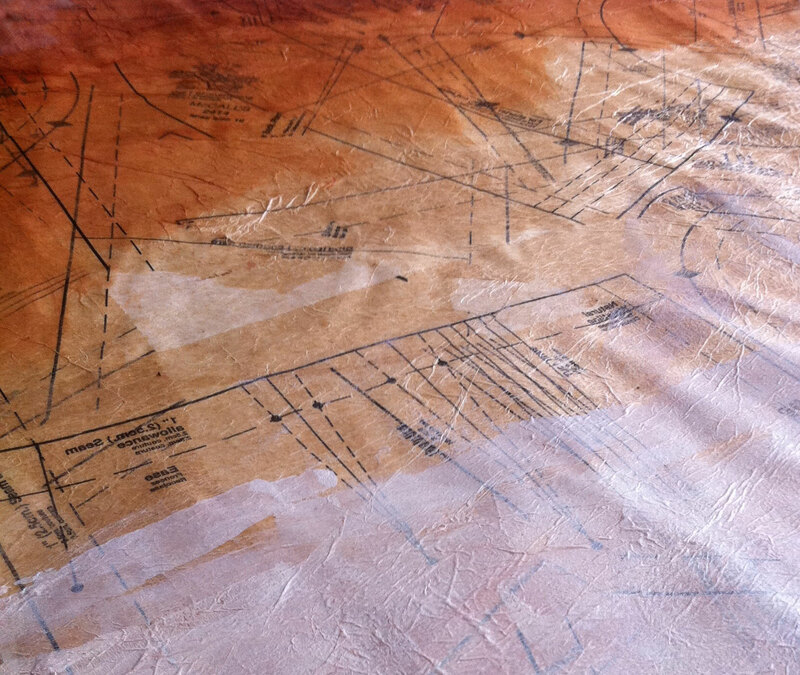 Then I applied the sewing pattern paper using a brayer. Then I had to let it dry. Overnight. No peeling up corners, no adding little bits of paint here and there, no nuthin’. Believe it or not, I was able to do that. Waking up this morning was like waking up Christmas morning. I donned my slippers and romped from my bedroom (as well as one can romp on a recently healed ankle) to look down upon my studio and see… pretty much what it looked like last night. Well, I hadn’t expected it to actually change. It’s just that after it dried, I was able to experiment with it. So I started with gesso. 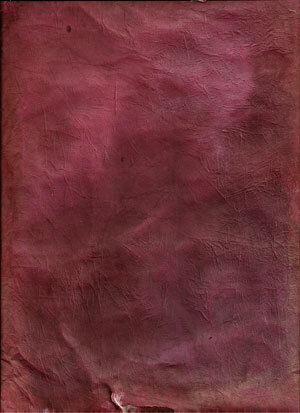 Ooooh, Gesso. I applied it to about half my paper, using my brayer, of course, to tone down some of the lines and to lighten some of it. Then I applied alcohol inks to the other half. Then I had to let that dry. So difficult. Good thing Sundays were made for naps! After nap time, I applied some sheet music, covered by another piece of pattern paper, to the inked-up area. It stands out a bit more than I would like, but that can be remedied later. I’m getting the feeling that this is all about layers. Layers upon layers upon layers. If you don’t like something, cover it up. And then cover it up again. This stuff can take it because it has fabric on the back. And I guess that’s the point. Add, add some more, sand, stitch, and beat the heck out of it. It just adds character. To the gesso side, I decided to add more ink. I’ve pretty much covered up the sewing pattern image on this piece, but who cares? Just because it’s in there doesn’t mean you need to see it. By the way, this is my first experience with alcohol inks, and I adore them. They’re pretty darned awesome. Lots of pigment in little bottles. 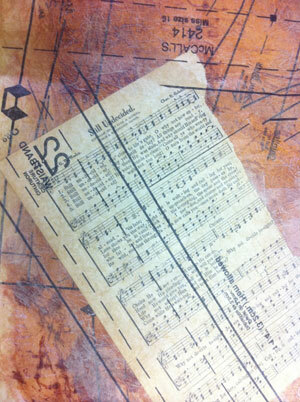 I also used some brown inks and some sparkly inks and some more sheet music on another piece of paper. I’m not crazy about it, but I can certainly cover it with some more inks, or paints, or paper, or whatever I want. What the heck will I do with this stuff? I dunno. I’ll probably draw on it, knowing me. And I’ll stitch on it, if I can find a needle that will allow Bernina to play nice with it. Of course, Miss Singer always plays nice, so I could just put her to work on the paper cloth. At any rate, I am sure to have many more experiments with this fun substrate. 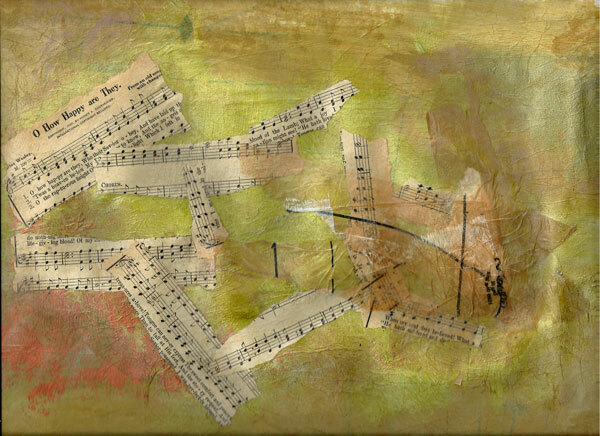 This entry was posted in creativity, technique and tagged art, collage, creativity, ink, mixed media, paper, paper cloth, postaday2011, technique. Bookmark the permalink. I see what you did there, and it is a combination of passive-aggression and didactic plotting. I’m impressed. And that pattern will never be sewn, or even see the light of a pure sun ever again. Way to go, woman. Thank you, David. It’s good to have one’s evil genius recognized for what it really is.